Sports were his life, but when football ended his senior year Delaney felt a void. He shed his chubby nickname, altered his surroundings, and left his doubters in the dust! I was the chubby kid in high school. I played football and everything, but I never felt like I was working as hard as I could be. After my senior year of football, I realized I had nothing left but school. That's when I decided to completely change my body and strive to become a bodybuilder. The choices affected my life greatly. I cut out a lot of people so I could accomplish what I wanted. There weren't many people who stood by my choices except for one of my best friends, Khooshali. She understood what I was doing was for the best, and she always stuck around. My life has completely changed after transforming. The people who doubted me cannot believe what I've accomplished. I cut a lot of friends out of my life. I gave up my social life. That was the only way to reach my goals. I'm in college now and can honestly say I don't go to parties. They aren't worth it, in my opinion. There were days that I wanted to throw out the chicken I cooked and eat a whole box of cookies and donuts, but I realized it would never lead to my goal. My inspiration came from within. I was my own inspiration, and I feel like that's the only way to transform. If you don't believe you can do it, you will fail. Believe in yourself and it will take you a long way. I had a trainer for a while, Tuan Tran, a professional natural bodybuilder. He helped me get to where I am today and opened my eyes to different training aspects and nutrition. Supplements alone will not help you reach your goals. It's about hard work and dedication. Figure out what you're doing and what's best for you, then include supplements. A diet is simple, yet complicating at the same time. You have to find your own caloric intake and avoid know-it-alls on the internet. Everybody is different. I went through many trial and errors to find out what worked best for me. Try to find a workout that works for you and go off of that. Here is the workout I used that helped me the most. I did a lot of pyramid training and found that those types of workouts made me work hard and helped me reach my goal. I performed cardio five times a week for 45 minutes on the elliptical or the treadmill. 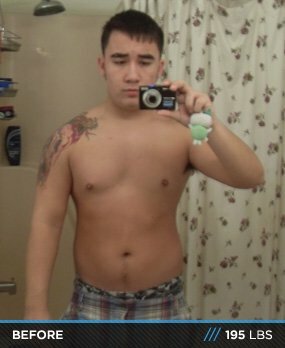 The diet is what challenged me the most. Living with my brothers makes it hard because they're always tempting me with junk food that I want to eat. I've developed self-control to reach the goals I want. 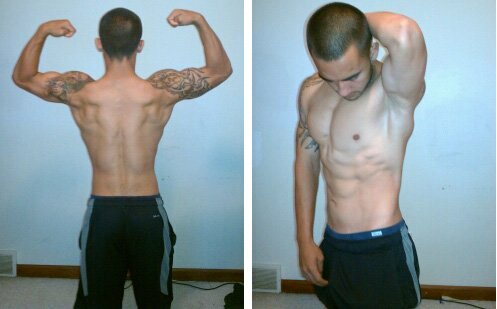 I plan to compete in my first bodybuilding show very soon. I feel like bodybuilding is a great way to showcase all of the hard work I put into my body. My suggestion for aspiring transformers would be to never give up. There are many sacrifices made to accomplish your goals, but it's completely worth it. You will sweat, be in pain, and crave pizza and ice cream, but never give up. It takes time to reach your goals, but when you get there, all the things you gave up will be worth it. Honestly, Bodybuilding.com is the best site ever. It helped me with supplements because the prices are amazing in comparison to others. The site has great articles and workout regimens. The purchases are quick and help is available if you have any questions about anything.